Based on a story from Goh, 45, living in a terraced house in Ampang, Selangor with his family. Goh has two children, a 4-year-old boy and 6-month old baby girl. His son is their happy pill as he is always a happy and active boy whereas their 6-month old baby girl is just adorable in many ways. Before moving in last September, Goh & family went for house viewing together with the property agent. Upon stepping into the house, his baby girl started crying and it just got louder and louder. His son too, was happily going in but he stopped and stunned for a while as if he saw something surprising. While Goh was busy talking to the agent, his wife was busy calming the baby. Their son kept pulling his mother’s shirt while pointing to the kitchen saying,” Mum! The jie jie (older sister) is asking me to play with her.” The mother looked at the kitchen but there was nothing. Thinking it was her child’s playful act, she continued calming the crying baby. So in the end, Goh and his wife carelessly made up their mind to rent the house since it comes with low rental. In addition, it has just been renovated into a nice and cozy house. Such a good requirements, of course they wouldn’t want to miss out this opportunity to rent the house. Feeling extremely excited to move in on the first day itself, they started by conducting a Chinese ritual. A dao shi (Taoist priest) was invited to their house to perform the ritual – but little did they know that in reality, it was a fake priest! He was making many weird and indifferent moves in front of the praying altar but Goh and his wife did not suspect anything. 2 weeks later, things started to go wrong in their house. When Goh’s wife woke up in the midnight to prepare drinking milk for her baby, suddenly, a loud sound was heard from the living room. 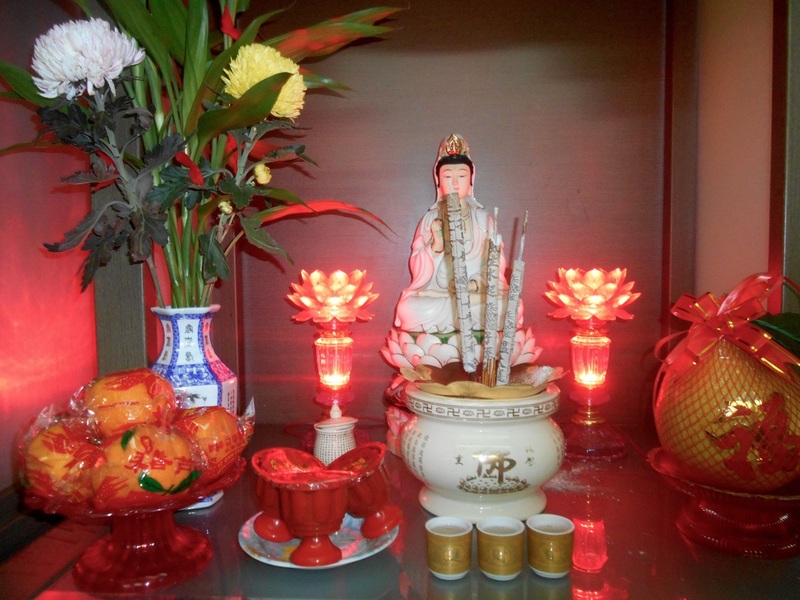 Without hesitation, Goh’s wife quickly runs to the direction of where the sound came from and found out that it was actually the God’s statue on the praying altar that fell off. She was so frightened that at that point of time, she couldn’t even shout for help. At that same night, Goh who was sleeping in the bedroom when suddenly he felt as if something was tickling his face. Without knowing what that was, he tried to turn on the lights to see what’s on his face. But when touched his face, he found out that it was someone’s long strands of hair. Immediately, he quickly jumped out of his bed and ran downstairs. He saw his wife crying in the corner of the living room and realised what happened. In the next morning, they talked to their neighbors about this. They showed no reaction as if it was very normal to hear sounds or see things in the middle of the night. “I can’t stand this anymore. I’d better look for some field experts to look into this,” said Goh. So, he invited a Feng Shui master to their house and he said it’s actually the spirit of a deceased Chinese family who was killed in this house 10 years ago. Goh was told that the long-hair lady was actually killed in the room that he was sleeping because she was caught having an affair with the wife’s husband that time. The wife, after killing the lady and his husband, took her own life by hanging herself in the living room. Ever since that day, the house has been left empty until 2 years ago, it has been renovated and restructured into a new house and rented out at low price. They were too terrified to continue living in the house. So, the next day, they quickly call the agent telling them that they want to stop the rent and move out from the house immediately. It was too much for them to handle even if another ritual was conducted later on to calm the souls of the dead in the living house. From this horror experience, they have learned not to choose a house based purely on a low rental price. There are many variables in selecting the best house to stay. Also, Goh & his wife shouldn’t trust the property agent completely as well – because it could be the agent’s fault for not telling them about the history of the house. All in all, it’s best to make a wise decision before you rent a house because you may not know what has happened in the past in the house itself!